Hammer-toe deformity is a flexion contracture in the PIP joint of a pedal digit, resulting in plantar flexion of the middle phalanx at the PIP joint with dorsal angulation of the proximal phalanx at the MTP joint. Hammer toes are associated with imbalance of soft-tissue structures around the joints in the digits and are often progressive. • Abnormal biomechanics (cavus or high-arch foot, flatfoot deformity, loss of intrinsic muscle function, and hypermobile first ray). • Long metatarsal and/or digit. • High-arch foot type (cavus foot). • Pain and deformity in 1 or more of the lesser toes. • Dorsiflexed proximal phalanx at the MTP joint and plantarflexed middle phalanx at the PIP joint of a lesser digit. • Callus formation at the dorsal aspect of the PIP joint and/or distal aspect of the digit. • Edema and tenderness on the plantar aspect of the lesser MTP joint(s). • Associated signs—Cavus foot deformity, flatfoot deformity, bunion deformity, transverse deformity of the digits, decreased ankle dorsiflexion, and bowstringing of the extensor and/or flexor tendons. 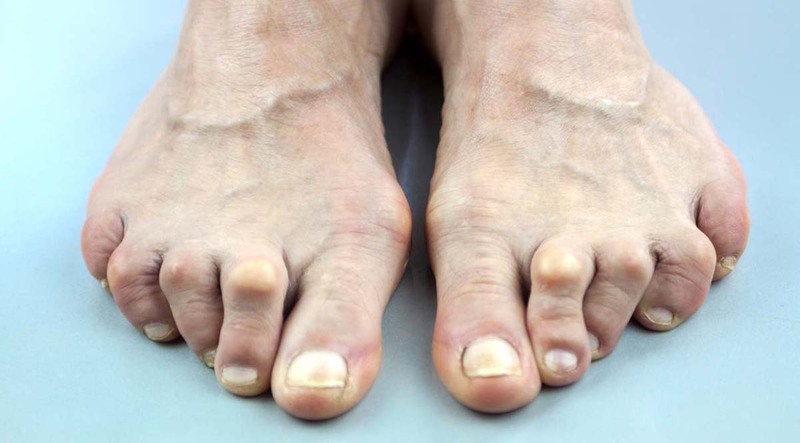 Diagnosis: The diagnosis of hammer-toe deformity is made clinically and radiographically. Management: Conservative measures and surgical treatment may be used to correct this condition. Note that a neglected hammer-toe deformity could result in ulceration in a patient with diabetes. • Splinting can be used in an early flexible hammer toe. • Custom-made orthoses are helpful to slow down progression of the deformity if it is caused by biomechanical factors. • Rest, NSAIDs, and ice help an inflamed joint and/or shoe irritation. • Consider surgical referral to a foot specialist to correct the deformity. • Percutaneous tenotomy and/or capsulotomy are used for mild, flexible deformities. • Resectional arthroplasty at the PIP joint may be beneficial for a more rigid deformity. • Shortening osteotomy of the metatarsal is indicated in the deformities resulting from the long metatarsal.